Contents are a list of elements in the currently active view, for example, map layers and tables. Contents display in the Contents pane in ArcGIS Pro. The contents for the active view can be configured on the Contents tab in the Task Designer pane for a task step. The step must be selected in the Tasks pane for the Contents tab to be available in the Task Designer pane. A view must be active on the Views tab for its contents to be available on the Contents tab. A task step can set the visibility, selectability, editing state, labeling, and snapping of layers in the active map view. For stand-alone tables, a step can set the editing state of the table. A step can also select a layer or table in the Contents pane. 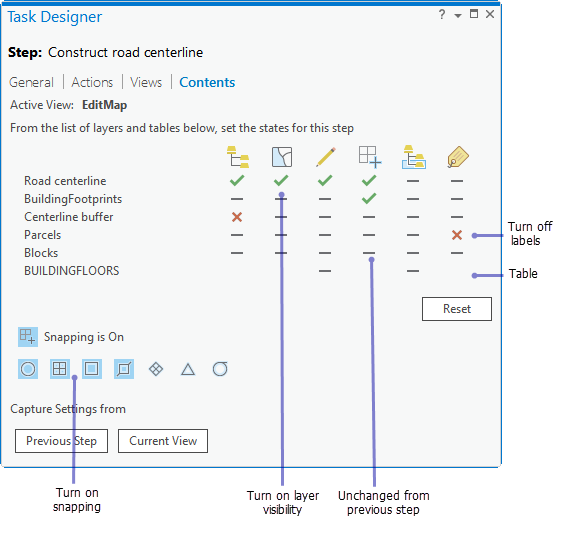 Configure contents in the Task Designer pane. Create or record the step. With the step selected and the Task Designer pane open, click the Contents tab. For each layer or table, click under the icons for Visible , Selectable , Editable , and Snappable to change the states of the layer. You can also press the V key to change visibility, the S key to change selectability, the E key to change editability, and the N key to change snapping. Click to turn the visibility, selectability, editing state, and snapping of the layer or table on . Click to turn the visibility, selectability, editing state, and snapping off . Click to keep the visibility, selectability, editing state, and snapping unchanged . The layer or table state remains the same as it was for the previous step or before the task started. Click Apply to View to see the chosen layer or table states reflected in the Contents pane and in the active map view. Click under the Select Layer or Table icon to change whether or not a layer is selected in the Contents pane. You can also press the H key to change layer selection. Click under the Labels icon to turn the labels of a layer or table on or off. You can also press the L key to change labeling. Turn Snapping On or Off for the active view, and click a snap mode to enable it. Enabled snap modes appear shaded. Instead of switching layer and table states, click Current View to match the current layer and table states of the active view. Similarly, click Previous Step to match the states and snap modes of the previous step. Click Reset to set all layer and table states to Performs no action and to turn off snapping. On the Actions tab, load the Modify Features command , which opens the Modify Features pane. On the Views tab, set the map view that contains the right-of-way feature layer as Active. On the Contents tab, switch the state of the right-of-way feature layer to Visible , Selectable , Editable , and Snappable . Switch Snapping to On and switch the snapping modes on the Contents tab. On the Actions tab, load the Attribute Table command. Click the Record icon on the command action bar, right-click a layer or a stand-alone table in the Contents pane, and click Attribute Table to load the command. On the Views tab, set the map view that contains the layer or stand-alone table as Active. On the Contents tab, set the state of the layer or stand-alone table to Visible and Editable . Turn on the selected state of the layer or stand-alone table (select the layer or table in the Contents pane).